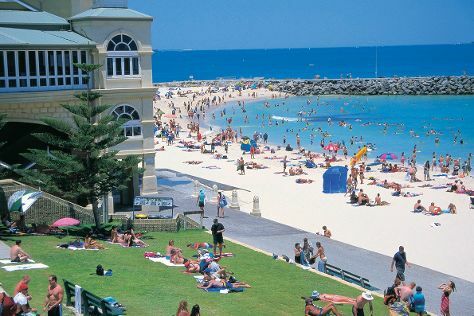 Relax by the water at Cottesloe Beach and South Beach Recreation Reserve. Take a break from the city and head to Swan River and Caversham Wildlife Park. Explore Perth's surroundings by going to Mandurah (Mandurah Cruises, Silver Sands Beach, & more), Beelu National Park (in Mundaring) and Serpentine Dam (in Serpentine). Pack the 10th (Sun) with family-friendly diversions at Adventure World Perth Australia. On the 16th (Sat), give your taste buds a day to remember with a local gastronomic tour. Next up on the itinerary: take in nature's colorful creations at Kings Park & Botanic Garden, kick back and relax at Rockingham Beach, steep yourself in history at Fremantle Prison, and tour the pleasant surroundings at Perth Zoo. To see other places to visit, where to stay, photos, and other tourist information, use the Perth trip tool . If you are flying in from Germany, the closest major airport is Perth International Airport. In March, daily temperatures in Perth can reach 34°C, while at night they dip to 19°C. Cap off your sightseeing on the 29th (Fri) early enough to travel back home.